Guitarist Mundell Lowe was a wonderful arranger with impeccable taste and intimate elegance. This was true of his big-band writing and those for small groups. Recently I posted on his Columbia albums for Joe Mooney (1963), his TV Action Jazz albums (1959), the score for Satan in High Heels (1961), Jerri Winters Again (1962) and J.J. Johnson's Broadway Express (1965). Two more beautiful examples of Mundy's touch were albums for singers in 1962—Alice Darr's I Only Know How to Cry and Kevin Gavin's Hey! This Is Kevin Gavin. It's interesting to note that Mundy never took on arranging projects if the artist was lousy. In both cases, Darr and Gavin were superb. 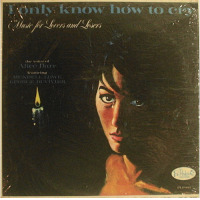 Alice Darr's I Only Know How to Cry was recorded for Charlie Parker Records and featured Mundy on guitar and George Duvivier on bass. Little is known about Darr. According to the liner notes, the album's cozy concept was conceived first. Then producer Aubrey Mayhew and Mundy went looking for a voice to match. Many singers were auditioned but failed to impress. The an agent steered Mayhew and Mundy to a small club where Darr was singing. She was perfect. Several of the songs on the album were composed by Joan Moskatel, who was little known in 1962 and even less known now. This is a brilliant album on so many levels, particularly Mundy's accompaniment on guitar. I did a little digging through old newspapers. Darr played piano and sang at her club engagements. Darr appeared often at New York clubs such as the Left Bank and the Toast and turned up in regional clubs on the road, such as the Win, Place and Show in Pittsburgh. In 1966 she toured military bases in the Far East before returning to New York's Apartment. In 1969 she was at Dino's in Las Vegas and at Chez Voltaire in Los Angeles. I would imagine she made the West Coast her home into the 1970s and beyond. Hey! This Is Kevin Gavin also was recorded for Charlie Parker Records. Do Nothin' Till You Hear From Me, Start Singing a Song, As Long as I Live and My Beginning With You was recorded by Doc Severinsen, Clark Terry and Joe Ferrante (tp); Buster Cooper and Urbie Green (tb); Phil Bodner (as,oboe); Walt Levinsky (as,fl); Boomie Richman (cl,ts); Sol Schlinger (cl,bar); Eddie Costa (vib,p); Mundell Lowe (g,arr); George Duvivfier (b) and Sol Gubin (d). For What Will Happy Now? Let There Be Love, You Don't Know What Love Is and Blame It on My Youth, a small group was used: Phil Bodner (ts,oboe,fl), Eddie Costa (p,vib), Mundell Lowe (g,arr), George Duvivier (b) and Ed Shaughnessy (d). The final four—The First Time You Love, Moon River, Where Is That Star and The Folks Who Live on the Hill—were recorded by Phil Bodner (oboe,fl); Eddie Costa (p); Mundell Lowe (g,arr); George Duvivier (b); Ed Shaughnessy (d); Bernie Eichenbaum, Marvin Morgenstern and Charles Libove (vln); David Nadien and Seymour Barab (cello); and Sid Brecher and Al Brown (viola). Gavin sounds a bit like David Allyn and, in spots, Frank D'Rone. According to old newspapers, he became a jingle singer and founded Kevin Gavin Productions, which in the 1970s produced music for television and radio and created entire campaigns using songs. Charlie Parker Records was launched by Parker's widow Doris and Aubrey Mayhew (above) to limit the release of many illegal live bootlegs after Charlie Parker's death. About 50 albums and at least five singles were released on Charlie Parker Records. The label was active between 1961 and 1965, at which point it was acquired by Audiofidelity Enterprises, Inc. It's a shame both of the these singers weren't more fully recorded. Both had terrific voices and both had a special jazz feel.